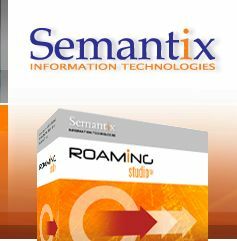 Semantix Roaming Studio is a TAP3/RAP/NRTRDE editor desktop application offering full TAP 3.x, NRTRDE 2.1 and RAP 1.5 support, conversions between TAP3 versions (upwards or backwards), validations, import/export to ASCII, error highlighting, custom field exporting to Excel, advanced editing operations and many other features. Allows you to work with TAP3/RAP/NRTRDE files using all the standard editing operations you are familiar with (in all the usual text editors, like cut, copy, paste, delete, undo, redo). You can cut and paste complete TAP subtrees. This allows for some very helpful re-use: for instance you can cut and paste an entire call, effectively “transferring” it from one TAP file to another or you can copy-paste charging information from one call to another. Automatic marking (bold) of the paths leading to edited nodes. You can therefore quickly see what you've changed on a file so far. For RAP files, the erroneous paths (leading to the validation errors) are tagged in red. 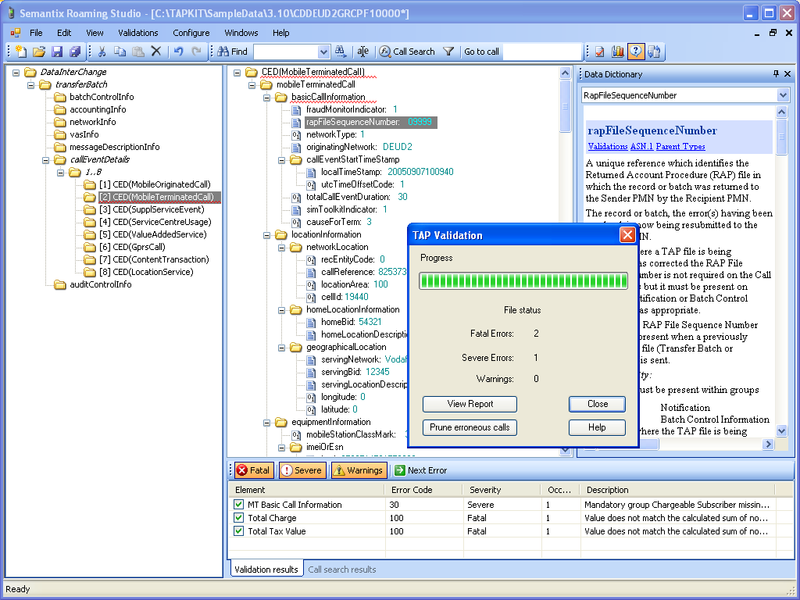 The editor comes with the ability of defining templates. You can define and use templates to quickly and easily create default call “subtrees”, default charging “subtrees” or even default entire files. Furthermore, you can select any existing file, call or structure within a call (e.g. a Mobile Basic Call Information structure or a Charge structure) and save it as a template for this type of structures. Rich file content views allow you to view in a snapshot all the information you need and to navigate easily in a TAP3, NRTRDE or RAP file. You can validate TAP3 and NRTRDE files, and navigate quickly to the next severe, fatal error or warning, or directly jump to a particular call. Quick search at your fingertips - Advanced search allows you to fine-tune your query. With the advanced search dialog you can search for any particular call type or enter any arbitrary Boolean condition with call fields (e.g. find all Mobile Terminated Calls with a charge greater than 100 SDRs). Search and replace inside specific fields/types - also using wildcards (*,?). Direct access to the TD57/TD35/TD32 documents - as soon as you click on a node, the data dictionary windows displays the relevant TD57/TD35/TD32 section! Validate any TAP3 file according to the complete GSMA TD.57 specs (all releases are supported). The full set of validations is implemented. Validate any NRTRDE file according to the complete GSMA TD.35 specs (NRTRDE 2.1 supported). The full set of validations is implemented. Override custom validation behavior by changing the severity of default rules (e.g. from "severe" to "warning") or the permissible values for range validations and save your own validation profiles. You can also indicate in your validation profiles any bilateral settings you want the validating logic to take into account as forseen by the TD.57 validation dictionary. Generate error-free files by automatically pruning erroneous calls (i.e. calls with severe errors). Quickly and easily navigate amongst validation errors. Simply select the specific validation error or errors you are interested in and loop through all their occurrences in the file. Validation errors are visually grouped according to severity and type. Easily maintain your own reference data. Reference data are maintained in a single XML file you can share with your colleagues. 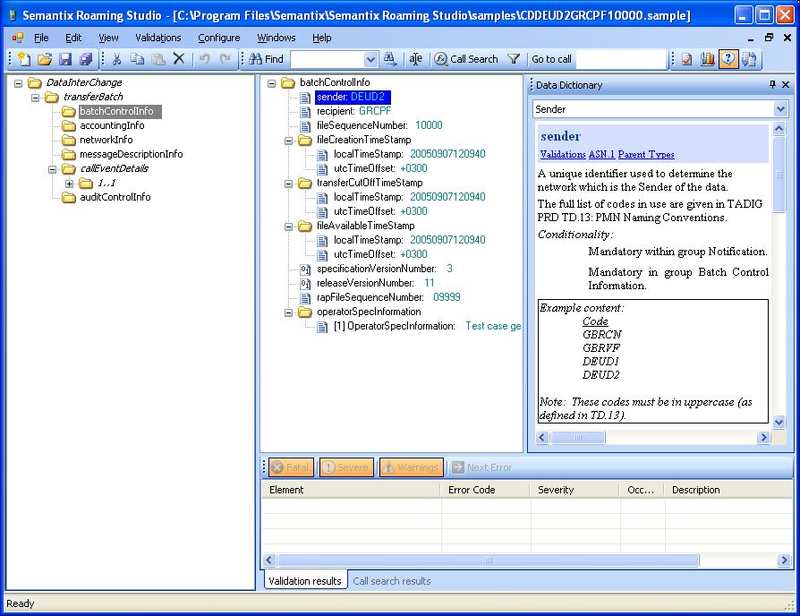 Reference data are maintained through the application GUI and are written in an underlying XML file. Converting a TAP file to a different TAP 3 release is as simple as choosing "Export To/Another TAP3 release..." from the file menu. 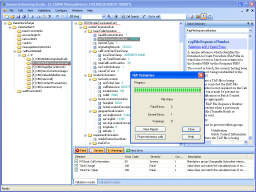 All TAP3 releases are supported (TAP3.1 up to TAP3.12 as of September, 2011) and conversions are possible both upwards and downwards. Converting a TAP file to a NRTRDE 2.1 file is as simple as choosing "Export To/NRTRDE..." from the file menu. No new fatal or severe errors should be added as part of the conversion processes. No attempt will be made to remove or “correct” existing fatal or severe errors as part of the conversion process. No attempt will be made to preserve them either. In order to maintain the semantic equivalence of the original file to the transformed file, some value mappings may need to be enforced. Any such “mapping” is something that “alters” the original file and as such they should be kept to an absolute minimum and take only place in cases where there is a very clear “semantic” equivalence. Intelligent TAP3/NRTRDE/RAP file splitting according to your own custom rules. Split a TAP3/NRTRDE/RAP file based on call age, call charges, call type or, practically any arbitrary criterion or condition you can think of. The splitting interface uses the same query engine as the “advanced search interface”. Audit control info structures are updated in resulting files so all files are valid after the split (assuming of course they were also valid before). Merge multiple TAP3 files into a single file. This can be useful when you wish to merge two different billing streams (e.g. one for your voice GSM calls and one for your data GPRS calls into a single outgoing TAP file stream). The reverse splitting functionality can also be useful in similar settings (e.g. split all GPRS or CAMEL calls into a second TAP file). Need to share your files with other peers? Use the anonymizing functionality to re-encode your files with all sensitive information overwritten or removed. Semantix has defined an XML-based import and export profile for each TAP3 release (as well as for RAP and NRTRDE). 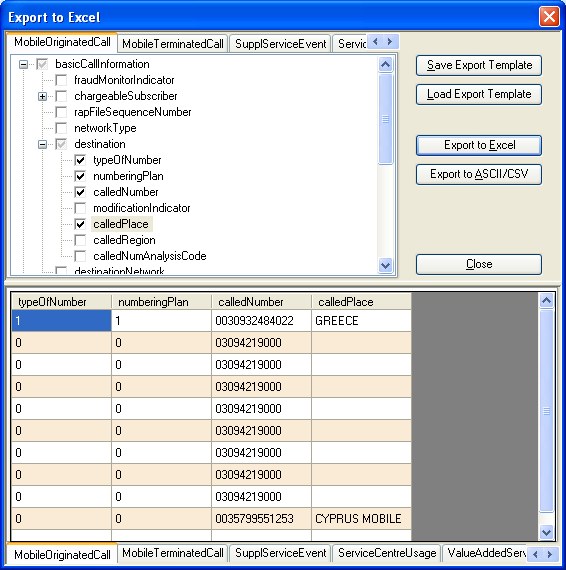 The export XML profile performs a full-information dump of the TAP3/NRTRDE/RAP file. 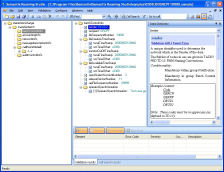 The XML import profile is used to reverse the process (i.e. from XML file to TAP3/RAP/NRTRDE). Since both import and export profiles are based on the related ASN.1 grammar it is possible to use the exported XML version of a file and import it to generate the identical original file. This in itself, allows advanced users to implement very advanced TAP3/NRTRDE/RAP processing tasks through XSLT transformations of XML files or any other XML processing (Perl/Python scripts, etc). For NRTRDE, you can also use a simple, comma-separated ASCII format that carries all information inside the original file (available through the "Export To/ASCII NRTRDE" and "Import From/ASCII NRTRDE" menu options). You can also perform complex field exporting, by selecting "Export To/ Excel-ASCII", and then arbitrarily choosing whatever fields you are interested in. 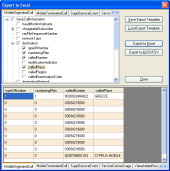 The selected fields can then be exported to Excel files or simple ASCII CSV files.